Kat and Karl : we can safely say this dress is not "it." we can safely say this dress is not "it." i think we can safely say this dress is not the one, but it's pretty isn't it!?! bridal and what not! july 15th people. july 15th. trotter-wallace extraordinaire. saturday: dress shopping with audra was fun. karl and i ate at the town pump which was surprisingly good. saturday night at the rose. also fun. kristen now thinks we are crazy/evil as karl and i told her all the intricate details of our fraternity/sorority presidencies. haha. it was hilarious. 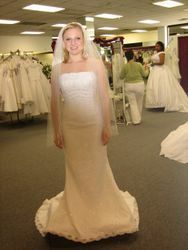 As Kat said when she was looking for a wedding dress (which I will never forget) "It's so...bridal." (with a negative tone) haha! Miss you! Aud looks tiny! Aww...look at Audra growing up on us! Tear! Wow, Kat, you and Karl should start a LR restaurant critique magazine or something. What's the town pump? i really think it flatters her and makes her look tall and elegant! but if this is not the one then i am sure the one that is will be even more gorgeous! i like it. i think it is very flattering as well. can't wait to see the one she picks. the town pump is awesome by the way. best fries ever and their ruebens are the best too. The Town Pump. YUMMY!!! I really miss The Buffalo Grill and Dixie Cafe here in St. Louis the most. It is hard to find good down home Southern food here. YANKEES!!!! wedding dresses are overrated. of course, i was in tears the day before my wedding since my mum was making me try on "alternate gowns" since somebody said the dress i had made wouldn't stand out among my bridesmaids...bah humbug. audra looks glorious, tho. that's an amazingly flattering style on her- makes her look so svelt (not that she isn't already-- i mean, seriously, she's the only girl i've seen look FABU in goucho pants). aww, I think she looks great in that dress! And, yes it WAS snowing in Tulsa- but its all gone now, boo!